As a Polar Bear emerges from behind the thick bush across the tundra of the Churchill Wildlife Management Area in Manitoba, Canada, he stops to peer out to see what lies ahead. One never knows when a polar bear will be lurking around the tundra bush or be peering around corners, a game humans do not want to play with this massive animals. This close up picture was unexpected, but one worthwhile giving us a look at his beautiful white coat, dark eyes and nose and small rounded ears. The type of tundra seen here is not one which a Polar Bear relies on to survive while they patiently wait for the arrival of winter and the freezing cold temperatures. This is when they will head to the shores of the Hudson Bay and hunt down their favorite meal of ringed seal, one they have been looking forward to feast on for months. Picture of a Polar Bear peering out from behind the tundra bush in the Churchill Wildlife Management Area in Manitoba. 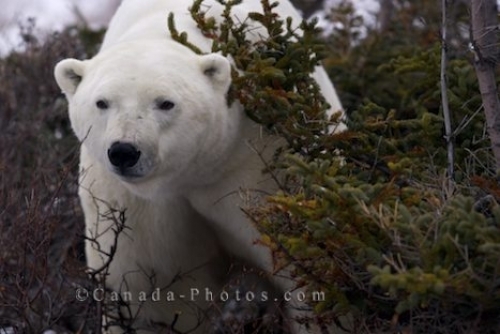 While touring through the Churchill Wildlife Management Area, it is wise to stay within a close proximity of the vehicle, especially when caught off guard by a Polar Bear peering at you from behind the bush. Backing away slowly and making a quick escape is one which is not underrated when dealing with a hungry Polar Bear.